I am a big fan of the Christmas jumper and every year for the past 3 years I have invested in one. This year I am getting bolder and am wearing this beauty from boohoo. This is the Niamh Reindeer Snowflake Jumper Dress which is £20 and comes in "wine" which is the colour I'm wearing, or black and white. It's an all-out "I love Christmas" dress! 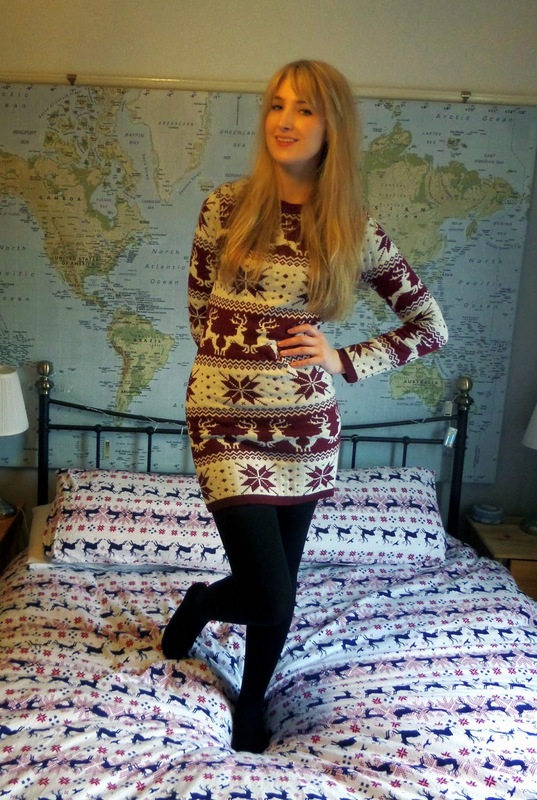 This jumper dress is so comfy and cosy! I wore it out to my work Christmas dinner and I was definitely over-heating! If you were going somewhere cold you could definitely pair it with a black skirt over the top so it looked like a Christmas jumper. It is really soft and great for lounging around on Christmas day in or wearing to the pub on Christmas Eve! And Boohoo are still offering Christmas delivery if you order before 8pm on 22nd December so get a wiggle on! That is such a cute jumper dress!